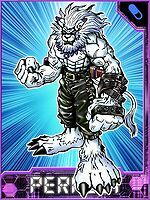 A Beast Man Digimon of proud justice. 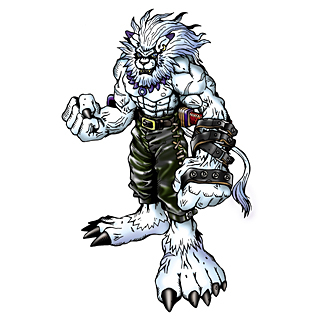 For some Leomon, who go through repeated training day after day in order to defend justice, it is a form that acquired power over the cold in the freezing lands of the Digital World's Ice-Snow Area, and evolved. By being in the cold, it tempered its mighty will and body, and they cannot be broken by any attack. 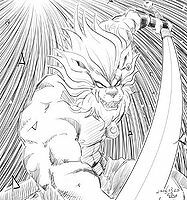 Its Special Move is firing a fist packed with cold air (Hyoujūken). 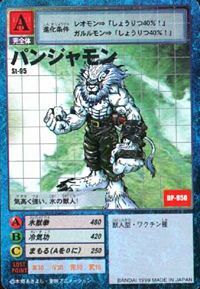 Panjya 「パンジャ」 is a reference to Panja, the father of Leo, the protagonist of the series Jungle Emperor. 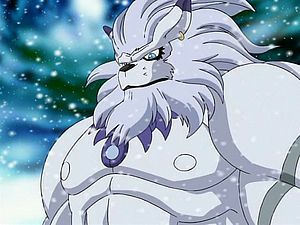 Anime/Manga Digimon Adventure V-Tamer 01: "Future Potential"
Hyoujūken  Ice Beast Fist 氷獣拳 N/A Frozen Fury/Ice Beast Fist/The Fist of Ice/Fist of Ice Gathers the power of cold air in its right hand and shoots a blast of cold air in the shape of a lion's head that freezes the foe. Reikikou  Cold Qigong 冷気功 N/A Blizzard Breath/Ice Breath/Frozen Shockwave/Cold Attack Slows the foe with a blast of freezing-cold breath. Cuts the foe with an icy sword. 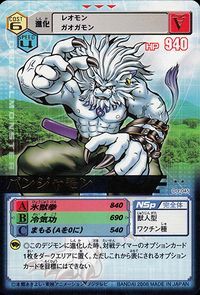 Jūouken  Beast King Fist 獣王拳 N/A Fist of the Beast King/Beast King Fist Gathers energy in its right hand and shoots a wave of energy in the shape of a lion's head from it. フルヒール Furu Hīru Full Recovery Healing technique that restores all wounds done to self or ally. Zan Ei Hanten Geki  Shadow Rolling Attack 残影反転撃 N/A Shadow Spin Kick Attacks the foe with a flying kick. 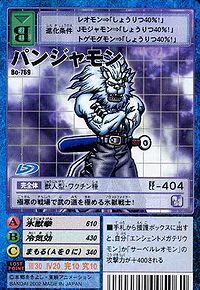 Panjyamon makes an appearance in "Double Spirit Miracle! Beowulfmon is Born". 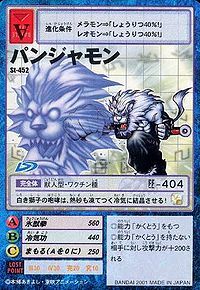 Leo evolved into Panjyamon and fought with Arkadimon. 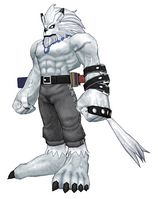 While Panjyamon does not appear in the game naturally, it is possible to obtain it via Game Shark and cheat codes, as it appears as an Adult-level Data type Digimon in Digimon World. Panjyamon cannot be obtained in any natural way in the game but inner data found that it was originally intended to be obtainable and that even its personal Digivolution Item, the Noble Mane can also be acquired via cheat codes, which if given to any Child level Digimon, it will automatically evolve into Panjyamon. Other Digimon are obtained in a similar way, those being Gigadramon and Metal Etemon. Panjyamon is the holder of the Wild 7s card. Panjyamon evolves from Leomon with 0+ DP. Panjyamon evolves into Saber Leomon with 0-8 DP and Holydramon with 9+ DP. Sublimely strong, the icy beast man! The howl of this white lion crystallizes its target with a cold blast that freezes even hot sand! This frost fighter mastered the way of the warrior on an intensely cold battlefield! ↑ Digimon Adventure V-Tamer 01: "Leo's Rage"
↑ Digimon Adventure V-Tamer 01: "Continuing Courage"
This page was last modified on 5 November 2018, at 13:51.